January 18, 2016, 4:21 p.m.
Oxford Union will debate the fate of a statue of British colonialist Cecil Rhodes this week, after the "Rhodes Must Fall" campaign to have it removed has gained national and international attention. A related campaign in 2015 was successful in removing another statue of Rhodes at Cape Town University, however Oxford University&apos;s chancellor has stated publicly that the statue outside Oriel College should stand. Cecil Rhodes was an admired figure at the time of the British Empire, but he also believed in the racial supremacy of the English – saying "the more of the world we inhabit, the better it is for the human race". 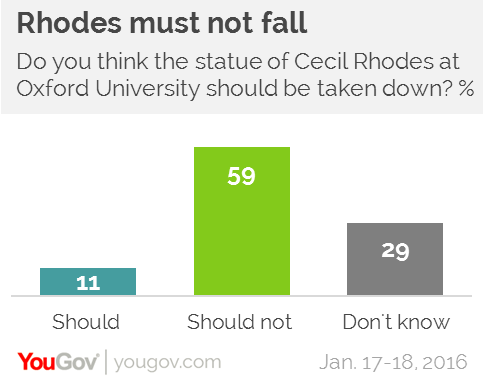 After being told Cecil Rhodes was a rich figure largely responsible for Britain&apos;s colonisation of Africa, who funded a trust for overseas students at Oxford but who is considered by some as a symbol of racism, most British people (59%) say the statue of him at Oxford should not be taken down. Only 11% say it should be removed and 29% are unsure. The highest level of support for taking down the statue is 19% among Scots, followed by 18% of those in London and 18% of Labour voters. UKIP and conservative voters are the most likely demographics to say the statue should stand (75% and 72% respectively). British people are not generally ashamed of the former Empire or of our history of colonialism. Only 19% say the Empire was a bad thing and only 21% say we should regret historic colonialism. 50% of UKIP voters and 37% of Conservative voters say Britain tends to view our history of colonisation too negatively – we talk too much about the cruelty and racism of Empire and ignore the good that it did. 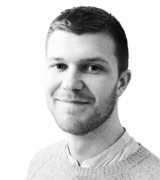 Young people (40%) and Labour voters (43%), on the other hand, are more likely to say we view our colonial history too positively, suppressing the cruelty, killing and injustice that went on. YouGov has previously found, in July 2014, that British people tend to say the countries that were colonised by Britain are now better off for it (49%) rather than worse off for it (15%). And 34% even said they would still like Britain to have an Empire, while 45% said they would not.